grandma's cookie jar: Save on Manners That Matter for Moms! Maralee McKee is a dear, sweet lady and I'm very happy to say she is a wonderful friend! I've had the joy of getting to know Maralee as I worked on a project for her and then remained friends . . . once you meet Maralee, how could you do anything other than remain friends???!!! Well, Maralee is known as the, "Manner's Mentor" and wrote a book designed to help moms, dads, grandmas and grandpas learn all about manners . . . which is really all about learning to be, "you at your best" and teach the children they love to be the same. Maralee's book; "Manners that Matter For Moms" is available until 6am (EST) on November 13, 2015 at an amazing sale of 40 - 70% off . . . think Christmas gifts!!! Maralee describes it in the following way . . .
You and your children are meant for more. More joy. More confidence. More peace. Imagine the life-changing joy of confidently shedding what holds you back and becoming you at your best... Imagine becoming the person you were always meant to be until self-doubts, insecurities, and the unkind words and actions of others clouded your life. Imagine yourself secure and happy in who you are, how you present yourself to the world, and the ways other perceive, interact, and respond to you. Now…image you easily pass the keys to doing the same on to your children, and spare them the pain of insecurity, self-consciousness, and self-doubt which takes away too much of the joy of childhood and often goes with them into adulthood holding them back from developing their full potential. What if by the time your children leave home for college, you can pass along to them through your example the gift every good mother (father, grandparent) yearns to give their children: the skills to thrive on their own as gracious, authentic, and kind adults? Is it possible for you and your children to experience this joyful life-change which positively impacts you and your family today and changes destinies and legacies? In a word, yes! And this word is, "manners". Yes! Manners! ...They’re little known and often counter-intuitive keys for living out the Golden Rule. Good manners have been belittled, ignored, and misunderstood for too long, and now look at the state of our culture. It’s time we learn the intricacies of modern manners and fully experience the benefits of knowing and using them ourselves; and then pass down these keys to personal influence, graciousness, and kindness to our children. Maralee McKee knows firsthand what it’s like to feel out-of-place in her own skin and environment and the lasting pain of the sting of self consciousness. She grew up scared, lonely, and abused. Thinking she was rescued from it all by her first husband she then found herself a young widow in her twenties. Never feeling like she measured up, and not knowing what to do with the rest of her life. God opened the door for her to attend an in-depth etiquette program for the answers she had been prayerfully seeking. She was changed from the inside out. Now her mission and joy is to bring this same knowledge to others. Introducing, "Manners That Matter For Moms"! * Exchange your self-consciousness for self-confidence as you uncover your authentic best. * Reduce your stress by showing you the easy steps to use to teach your children to walk in graciousness without you ever having to nag or become the etiquette police. * Change the tone of your home from “me first” to one of calm, joy, mutual respect, and gratitude. * Free yourself, and your children, from social self-doubt, self-condemnation, or awkward feelings and interact with anyone with authentic confidence, joy, and graciousness. This book is packed with more than 100 skills, plus Maralee’s personal formulas and keys for easily leaning, using, and passing them along to your children. It’s full of warm stories, and funny, life-gets-real moments from her daily life with her husband and two boys, her thousands of students, and hundred’s of thousands of readers of her MannersMentor.com blog. For just 48-hours, get the book for 40-70% off! The more you buy, the more you save! 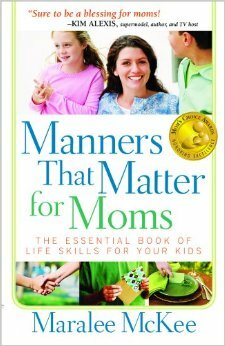 "Manners That Matter For Moms" works great for gifts, study groups, and more. At these special prices, you can't afford not to stock up! Click here to get the book - 40-70% off!